The SALAV HS-100 Duo Press Hand Held Steamer is a powerful 1150 watt garment steamer, built with the latest heating technology that produces powerful, drip-free steam in a quick 50 seconds. 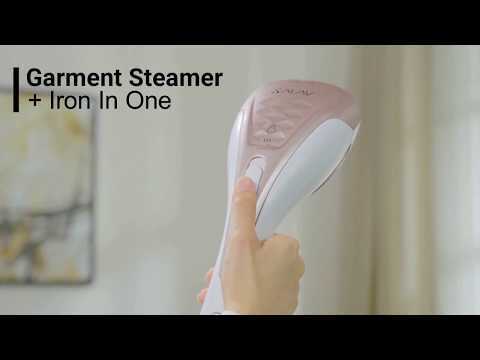 The dual heating technology creates both steam and heats the ceramic ironing plate to evenly distribute steam. Reaching temperatures of over 300° F, the HS-100 will press and straighten even the toughest wrinkles. Steam in all angles with no leakage and water spitting with two settings. The Ironing Mode produces dry ironing for pressing heavy duty fabrics and the Steaming Mode releases powerful and continuous steam to gently release wrinkles. Compact, easy to fill and use, the HS-100 is lightweight, portable and convenient. 15.75" x 4.41" x 4.13"